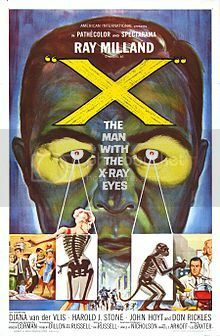 “Suddenly he could see thru clothes ... flesh ... and walls!” In his 1981 nonfiction book on the horror genre, Danse Macabre, Stephen King refers to X: The Man with the X-Ray Eyes as “one of the most interesting and offbeat little horror movies ever made, and one that ends with one of the most shuddery gross-out scenes ever filmed.” I won’t ruin it for you but the ending is definitely not for the squeamish! Directed by Roger Corman, this low-budget, existential science fiction/horror film stars Ray Milland as renowned “Dr. James Xavier,” who develops eye drops that allow him to see well beyond the normal field of vision. Initially, Xavier’s newfound super vision lets him have a little fun by checking out women at a “groovy” party (of course all of the naked beauties are cleverly concealed by props in the apartment!) and winning big at a casino. Then Xavier gets more ambitious (using his vision to perform a complicated surgery for instance). However, as you might expect, Xavier starts to lose control of his experimental foray into the unknown with tragic consequences. Useless Trivia: Look for Don Rickles as “Crane,” an obnoxious carnival barker doing what he does best – insulting everyone in the audience!